And a couple of other things. New ways to enter and a couple of rules. Nothing hard. 1.Please make a comment and choose which of these amazing bags you want and why. Blue is a smallish purse with red gingham inside and a little zippered section to stash your keys. Tropical has a wooden handle velcro closure and fun pink tropical lining. Tote will hold a Bible keys, phone and a couple diapers too. It is denim on the inside. 2.If you answer this question correctly you get another chance...Why am I celebrating Christmas in August? 3.Enter as often as you like by visiting my blog and commenting on each post. Each post will direct you back to today's post in case you send friends over so they can choose which purse they want. 4. Send a friend you have to let me know and become a follower. comment there too be sure and mention you went there from here. It is that easy. This Gift a Way will end Sunday night. I'll draw and post the winner. One last rule. If you are the winner you must respond to my comment on your blog by noon on Monday so I can get the Gift in the mail on Tuesday. OK? Well good luck everyone. Have a Blessed Week. Thanks for all the sweet and wonderful comments this week. Thanks for visiting my blog. And now the results....hold on a minute I have to draw a name. Sorry my camera is acting up can't document hope you trust me. Snowwhite...Congratulations! I'll be sending you an email so I can get your address to snail mail this weeks Beth Moore. O.K. to announce another giveaway. This week I am changing the name and the rules. The name is now Gift A Way. I am going to give a Gift once a week at least during the month of August. And since August is only days away the Gift a way begins tomorrow. Come back tomorrow for the surpirse gift. Oh I almost forgot...why am I doing all this gifting? Because I celebrating Christmas in August. More on that in a few days. Have a Blessed Week and don't forget to comment. And only because I am feeling really, really giving if you comment here you'll be entered. Good Luck. Merry Christmas in August. I love 3rd Day. I don't there is a song of thiers that doesn't move me. This one is one of my favorites and there are many times that I am in that place needing Him more and more. Amy hosts Then Sings My Soul go by and visit her. Because I am playing over at Karen's today getting some inspiration. I left a post there come and join us! I found this new Thankful Thursday meme and thought it would be fun to try and meet some new people. It is simple just post 5 things you are thankful for this week. 1. Rain. Gloriuos rain. 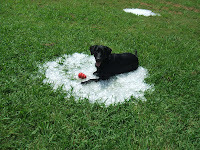 We have had a few days of little thunderstorms. All that wet has been great for the grass and the tomatoe's. Thank you God! 2. Lower temps. The glorious rain has brought us temps in the 90's for a few days. Last night we took a short drive with the dog and it was actually cool. 3. Leisure car rides with the dog. She loves to go. She loves the convertible. She is so good. There is one bridge by our house and she always lays down when we go over it. Funny thing to see. It is only in one direction the other direction she doesn't lay down. 4. Simple pleasures that make me smile like car rides with the dog. Seeing a frog in a bucket of water. (See my WFW post) Red tomatoes on the vine. My grandbaby giving kisses to grandpa. 5. I have heard it say husbands/dads make better grandfathers. I am now witness. My Cowboy was a great dad but not always home because of travel and hunting. He is home everyday now and when the grandbaby comes here they have some great times. They have thier own little special games. In case you need something to make you smile today here's a photo. I am sorry this is too small to read. I didn't realize till I was ready to post it that it turned out so small. I hope you still enjoy it as much as I did when I took this photo. 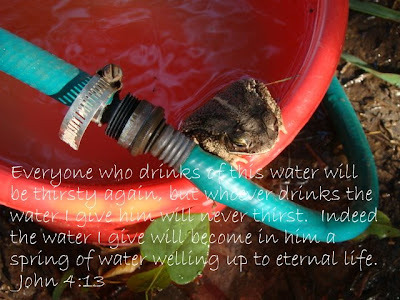 When I saw this the other day I knew it was perfect to illustrate this verse. Visit Amy for more Wordfilled Wednesday posts. Last week the most amazing thing was happening in my backyard. I have never seen anything like it except in movies or on the news. My little sideyard was infested with butterflies. There is a big old tree in the yard and everytime I walked in there I would disturb them. It was the most beautiful sight I have seen in a long time. The side yard is where my rabbit hutch is and so since it was so hot I was having to go in a couple of times a day to give them ice and water. And each time I went in I was greeted (at least I like to think they were greeting me and not angry! LOL)by so many butterflies that I could not count them. I wish I could have gotten some pictures but they were small and moving so fast I was not able to get a picture. I found some on the web and so today I give you a lovely photo. And a scripture. Satisfy us in the morning with your unfailing love that we may sing for joy and be glad all our days. Psalm 90:14. I hope find joy today and things that make you smile. Welcome to my Week Two giveway. I have another Beth Moore Study including the listening guide and the audio tapes. I know you will like this one. It is a study of David. forget to come by everyday and enter. Have a Blessed Week. btw I wrote a post over here today too. My new friend Becky at Hannahgracefinn.blogspot.com send me an email and I will get the Beth Moore study off to you! A Heart Like His Seeking the Heart of God Through a Study of David. Hmmm this sounds good maybe I want to enter! LOL. Oh wait there is more but it is a surprise at least for awhile because I haven't taken photo's but I will give you two hints. #1 It is a handmade wood item that my father made. #2 Quilts....that is all the hints you'll get. So leave a comment and become a follower and you will be entered. I am making one slight change for this week. I will do the drawing on Sunday night late and get it posted you can see the winner early on Monday. Good luck and have a Blessed week. 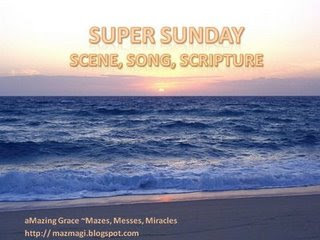 Welcome to Simple Sunday hosted by Peggy. A place to find simply a verse, a photo or a song. Today I am not being really simple because I am posting two videos. The first is a drama video I posted yesterday for Then Sings My Soul. I posted it yesterday because I just wanted to share it because it touched me so much when I first saw it and well that is what Then Sings My Soul is all about. Then this morning I was at my friend Debra Kayes and she had posted this Matt Rodman video You Never Let Go and well it just goes along beautifully with my Saturday choice. I don't know where you are today. I don't know whether you have come by because you are a regular visitor. Or if you just happened to stumble in but for whatever the reason I know that God sent you this way today. Because he either wanted to tell you for the first time or remind you that He will never let you go. No matter if you have known him for awhile and right now your struggling. No matter if you never really met him. He is there. In the second video the drama really gives you a visual of how He will be there for you. To pull you out when you ask. When you turn to him and seek him He will never let go. If you have never accepted Christ as your Savior and you are struggled if there are things in your life that pull you away from God please watch this video. I am praying for you. I am praying as God is holding onto you and reaching out to you right now. Today I am sharing two videos. The first is the song Everything by Lifehouse with the lyrics. This song has spoken to me. This is an amazing drama. The first time I saw this it took my breathaway. Each time I see this I am reminded of our saviors strength and his love. 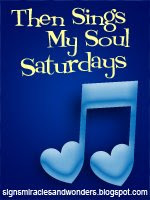 Then Sings My Soul is hosted by Amy go and visit her for more wonderful songs. A flower and a sweet Blessing to you. My post is Here . Come over and visit but don't forget to leave a comment here to be entered in the Beth Moore drawing. Don't for get to leave a comment to enter my drawing for the Beth Moore study. Become a follower and get another chance. There is a photo of this weeks giveway on the sidebar or you can read yesterdays post. Sometimes I wonder where you guys creativity comes from? I read so many great blogs just look at my sidebar and my followers there are some great writers out there. And ideas wow all those awards that go around and the meme's and the carnivals. Well I am not a creative person. My creativity comes from others most of the time. I am being totally open and honest here. I am a copy cat. There I said it. Whew. I am glad that is off my chest. Like I said I admit it I am not really very creative. But I am good and learning from others. I am a very visual learner so I guess that is why I enjoy blogging so much because I love looking at all of the pictures of peoples homes and the projects they are working on and the quilts. I spend many hours looking a pictures of quilts and dreaming of getting back into my sewing room again. 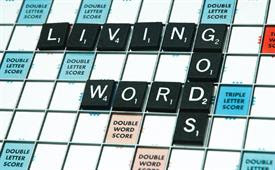 So, I have admitted my habit (date I use the s. word) of looking and borrowing (clearing my throat here) your ideas and your wondering what does Putting a lid on it have to do with being a copy cat? Well if you go over to Rachel's she has suggested the funnest thing today to make your home a sanctuary. Her blog is one of my favorite places to visit. She reminds, encourages and inspires everyday. If you are struggling at being a Proverbs woman or you aspire to be a Titus 2 woman then follow me over visit Rachel she inspires me and well I get a lot of ideas from her. We'll just call it inspiration. What do you say? BTW the white container on the top shelf is filled with mismatched lids. And in case your wondering they make great toys. Still counting down to my party....but today is the beginning of the giveways. Here's what I am giving away this week. The is is the casette tape set and listening guide to the Beth Moore study. I will be giving it away here next Monday. To enter leave a comment on this post and any other post through the week. I will draw the name on Monday morning. For another chance to win become a follower of this blog. And for more chances go to my sidebar and check out my other blogs; go visit them and leave another comment. And now here's my Monday 4 Missions post. Welcome to Monday 4 Missions hosted by Peggy. She has an amazing vision to share Christ through missions and encourages us to seek a ministry opportunity and to follow His commands. Today I want to share a ministry that we became associated with a couple of years ago. Texas Alliance of Raceway Ministries...is located or does ministry at Texas Motor Speedway. Here is some info. from thier website....As TxARM developed, its mission and purpose became clear--"to establish an alliance for cooperative evangelistic ministry during NASCAR and IRL sanctioned racing events at the Texas Motor Speedway." Everyone agreed that the ministry's function would be "sowing seeds representing the life-changing power of Christ, through written and verbal testimony and ministry, to the lost at the Texas Motor Speedway." With these purposes in mind, it became the vision of TxARM to carry out the Great Commission in the "marketplace" of the motor sports entertainment world. As 1997 continued to unfold, TxARM minsitry leaders began to communicate the vision to the Christians of North Texas. What they really do is share Christ with the people that come to see the races, the staff and the drivers. How they do it is by setting up a hospitality tent with snacks and water and by giving free golf cart rides from the camp ground to the gate. All the volunteers are trained Chaplains and they are also available in case of emergencys. They have been available when there was a shooting, when campers catch on fire, during medical emergencies. This is an amazing ministry that we are a part of when we can. For the next 3 weeks our ministry Auto Mission is partnering with TXARM at the summer Drag n Brag series. My Cowboy takes 6 boys each Friday night to do community service. They check in cars and help were they are needed. They work with the Chaplains and they learn about God and serving others. If you live near any kind of race track I am sure there is a race track ministry. It is a great place to go and minister and share the love of God. Praying your Sunday is Simply Blessed. Enjoyed this worship video. Since I am havin' a party in a few days I wanted to give ya'll a fun upbeat song today. So clap your hands, spin around sing for Jesus and Pass it on. You can go by Amy's to see more Then Sing My Soul posts and come back here Monday for my first Giveway! 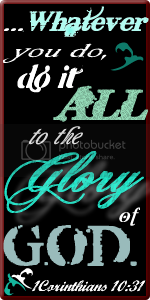 Giving Him Glory, Honor and Praise! Welcome to Thankful Thursday and my list of things that I am Thankful for. I am thankful that in a couple of hours the house won't be quiet anymore! My grandson is coming to play....he is one and walking all over still a little wobbly but Praise God he is healthy and active. I am thankful I am so busy that I am not sure which project to work on. I have a party coming up in a few days. Did you see the count down at the top of the page? And I got approval for our ministry to do a Family Expo in October. This time we are doing a two day event a Friday night dinner fundraiser and a Saturday event. If you don't mind would you pray for these events? We are trying to get a fabulous Christian singer to be our entertainment on Friday which will be great and will really help sell tickets. Come by on Monday to read more about our ministry or go and click on the link on the sidebar. Sorry I was off on a rabbit trail...speaking of rabbits I love them and I have three that I got earlier this year... I am thankful to have them and thankful that God provides what we need to take care of them and the rest of the animals. I am thankful also that God brought us to this house and that we have a wonderful landlord that hasn't kicked us out because we are late on rent again. I am thankful that God continues to show me that he is in control. I am thankful that I am a little more patient this month than last month. I pray I learn this lesson soon. I am thankful for Lynn who is hosting Thankful Thursday go by and visit and don't forget to come August 1 for my party. Can you think of anyone in your life who does not know Jesus? Ask your mom to write their names on a note card. Pray for each person every night of the week. Ask Jesus to help those people come to know him. Ask him to change their hearts and add them to his kingdom. A. Listen patiently, and clean the rest of the room. B. Wait until she leaves, and stuff it all under the bed. C. Argue with her, telling her she is wrong and the room is clean. D. Start crying because you want to go outside right now. 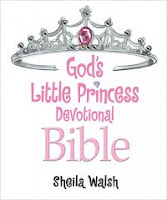 I enjoyed reading this Princess Bible. I know that you will be pleased to give it to your little Princess and you will enjoy reading it with her. Did I mention the lovely pictures and illustrations? The pages are all different and colorful and look like scrapbook paper. I know that your little Princess will enjoy it even before she learns to read. You can go to Amazon and purchase today. Why not begin your Christmas shopping early? Thanks for coming by today dear friends. I hope you enjoyed my first Book Review. I'll be reviewing a new book next week. 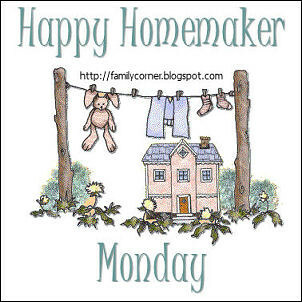 Today I am joining Sandra's Homemaker Monday...come and join. The weather in my neck of the woods: Cool 85 yea! New Recipe I tried last week: I tried a baked bean recipe Saturday I found on the internet. I guess it was good. I don't eat baked beans. Favorite Blog Post of the week (mine or other): Not a post...I had one but I liked this better. Sandra's tip was great! "Every two weeks or so I rotate the appliances on my counter tops, I actually take one from my pantry and set it on the counter, if I see it then I use." Ok this might sound silly but what a smart idea. Thanks Sandra. Devotion, Scripture Reading, Key Verses: My verse for this year is Proverbs 3:5&6 I must lean on it most of the time. Trust in the Lord with all your heart and lean not on your own understanding. 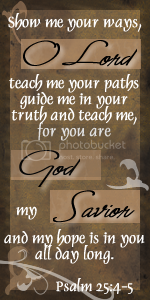 In all your ways ackowledge him and he will direct your path. Outside my window... glorious sunshine and a little dampness left from the rain and tomatos on the vine. I am thinking... how much In enjoy gardening and am excited to get started on a fall veg. garden. From the learning rooms... Still trying to figure out how to get the family(families my kids are grown I have an 8 year old grandson, a 1 year old and a 6 month old) together memorizing scripture. From the kitchen... Tonight chicken fried steak, mashed potato's salad. I am making applesauce muffins for my grandson for tomorrow when he comes here. Looking for a cockpot recipe for sirloin. I am creating...Redoing my sewing room it is a long process...this has to be done before I can go back to creating. A few plans for the week...finish the sewing room, take photo's of the after (the before and during is too scary and embarrasing to photo) plant some tomatoes for fall and check out the local nursery to see what else is there, and write posts and visit all you guys. 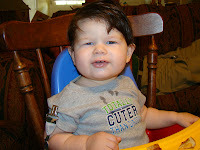 This is the grandbaby I am off now to go babysit. I'll link up to Peggy's SWD later. Have a Simply Blessed Day before you go I wrote a Monday 4 Missions post just before this one. Please stop there before you go. Today I have a little different kind of post about missions. Peggy reminds us that God calls us to serve. And for weeks now we have all been sharing about different ministries. And some people have shared with us ideas about different projects that we can search out in our own homes to participate in. Denise has shared some great thoughts and suggestions and many others have written some wonderful posts. 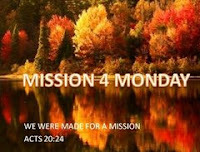 I am honored to be a part of Monday 4 Missions. Today the mission I share with you is a personal one God has placed on my heart. My mission is to minsiter to a young mother. My friend Lisa is spending the next year as a single mom. Her devoted husband left last week for a year long deployment in Irag. We met them a few years ago at church. They became good friends and supporters of our ministry. Stan and thier son came and volunteered on Thursday nights. Stan and my Cowboy and the other volunteers taught auto mechanics to the boys. On Thursdays I didn't have a girls program. I used that night to prepare for my Friday program. Thier son would come and help me set up the scissors and pins and fabric kits. We would always prepare dinner for the boys and set the dining room table. I never will forget the first night they were with us when we sat down to eat. My Cowboy asked for a volunteer to pray and Stan's son raised his hand before anyone else could. He was in first grade at the time. He said a prayer that would knock your socks off. All the boys sitting around that table were amazed. I was amazed that a child that young could minister to these "tough" kids. That group of boys that night were softened, thier hearts were touched. Stan and his wife Lisa were the directors of our Sunday School class they worked hard to always share with our class about what was going on with the ministry and help us recruit volunteers and support. We miss this amazing family. And I know how much Lisa misses her husband. I know how much thier son misses his dad. My mission is to send a 'snail mail' and an uplifting and encouraging email each Monday to Lisa. As I think about Monday 4 Missions and write a post about our ministry I'll think of Lisa and I'll think of Stan and the service he is doing for our country. fort at home while her man is away? Have you prayed about serving God but didn't know how? Maybe a simple card or email would brighten a young wife's day. Our friend Lisa came for a visit this past weekend. We got to have lunch on Friday here's a photo. Before you go please run over here and read my ministry post. Here's a scripture for you today. There are more Super Sunday posts at Peggy's. May he be the God of your City; Lord of this Nation, King of people and Hope to the Hopeless. My hope for us today . . .
Not that it was planned but it appears that I am on a break. So I leave this gift for you. Please come back for a visit. Even if I am not writing I'll be thinking of you and leaving little gifts like this. I am visiting all my friends. If I don't leave a comment I just didn't have time. If you are on my sidebar or if you are one of my followers I am coming by and visiting you, praying for you and soaking up inspiration and encouragement. Hopefully things will slow down in a few days.